Do yo u have an uncontrollable desire to yell, “KABAMA-LAMA!! !” more frequently than you already do? 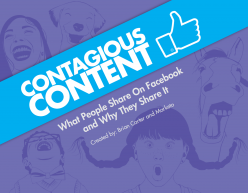 Then you definitely need to create Facebook posts that get more shares. Because when Facebook page admins discover one of their posts has ‘gone viral’, they can’t control themselves. They yell out strange phrases. They fist bump, give themselves a high five, and show off their really bad dance moves. Hopefully they have someone in the office to share this with. Otherwise the accounting department sees it and starts looking for irregularities in the social media side of the ledger.